This beautiful, single storey villa with lovely classic interior stands on large, flat, and fully enclosed grounds. The villa is only 4 km from the famous wine-growing village of Châteuneuf-du-Pape and 1.5 km from the charming village of Sorgues. The Popes chose this place in the 14th century as their summer residence. Children can play freely in the grassy garden with its shadowing trees and private swimming pool. The villa is situated on a departmental road (some traffic noise during the day) between Sorgues and Châteauneuf-du-Pape, but this is certainly not a nuisance. 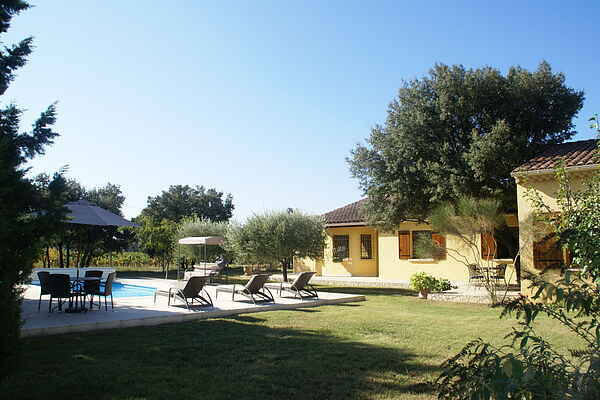 The location is ideal for exploring the Provence. You must visit the Papal Palace in Avignon (14 km), a beautiful town to potter about for a day. And do not forget the picturesque villages in the vicinity, such as L'Isle-sur-la-Sorgue (22 km), Fontaine-de-Vaucluse (37 km) and Gordes (43 km). The winding road to Mont Ventoux (55 km) takes you through gorgeous landscapes, and once you reach the top you can always still decide to make the climbby bike next year! This villa is located at a distance of 100 meters from the holiday home FR-84700-04.